There’s much more in a Still Life than a few objects painted on a canvas. Still Life paintings give opportunity for both visual enjoyment and symbolism to communicate a message to the viewer. In this Still Life composition we see the eye is continually drawn back to the pipe resting on the deep blue velvet draped material. 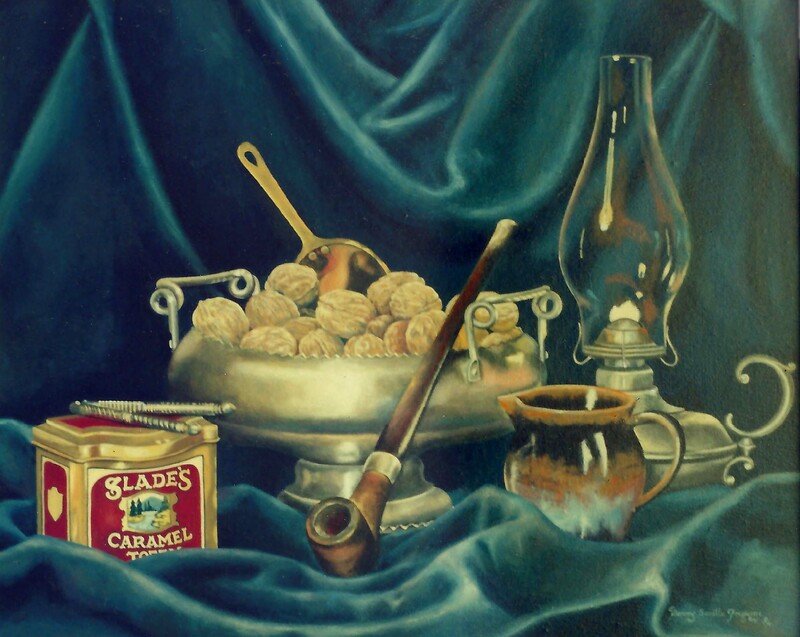 Notice how the folds of the fabric, the nutcracker, the brass scoop in the walnuts, the pipe stem and the handles of the glazed pottery and pewter lamp all draw the eye back to the middle and down the pipe. In designing a living space I like to take into account the individuals who live within the home. The thought is that each person should be represented when someone views the home. Is it obvious from the furnishings and the art whom occupies this house? If there is a married couple in the home, does the space look comfortable for both men and women? In this painting I wanted to accentuate some things that for me spoke of my husband as man of the house. The colors are masculine – deep rich tones. The pipe belonged to my husbands father. One of the ways my husband would help me is to crack walnuts as he was watching sports events, and so you see they are represented here. A pewter lamp was a wedding gift to us from his son. The metal elements symbolize physical strength, something I have really appreciated about my man as he helped build our home. Yet the velvet is a fabric that can be gentle and tough at the same time. I believe there is a song lyric from Leader of the Band (by Dan Fogelberg) that speaks of a thundering velvet hand as referring to his father’s compassionate discipline. My husband would be described as such a man. Can you tell how much I respect him? I do. And so, paintings, in their symbolism, can say many things.